Some of my real life and Facebook friends, as well as relatives of them, have died. A while after their funeral, you suddenly see that Facebook is telling you that it’s the dead person’s birthday. And then a lot of people who don’t know that this person has passed on are posting birthday greetings. It’s awkward, and can also be hurtful for the dead person’s family and friends. However, there is a way to prevent this from happening. You can actually decide who should manage your Facebook profile when you die. This person (you can choose more than one) will then be able to do things such as pin a post on your timeline, respond to new friend requests and update your profile picture. They won’t be able to post as you or see your messages. 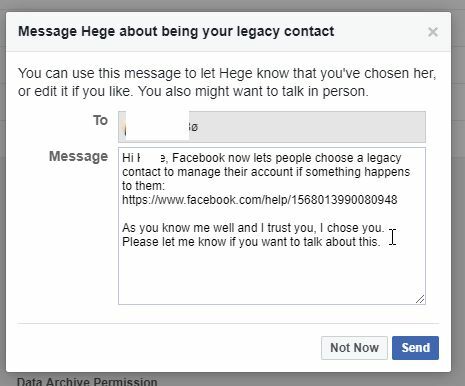 You can edit the message that you want to send to the contact that you’ve added as your legacy contact. If you don’t want to send the legacy contact a message, just click Not Now. They will still be added as your legacy contact, and you will receive an email about it. However, I will strongly advice that you contact your legacy contact about this! And that’s it. 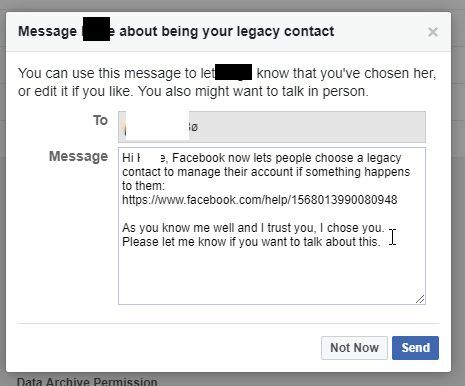 You now have a legacy contact who will take care of your Facebook profile when you die. What will happen now is that when you die, and Facebook gets a confirmation from your family, or others, that you indeed are dead, they will delete your account. Too morbid? No, this is something you should consider about all your online accounts. Who will clean up after you? What do you think about this functionality and this tip? 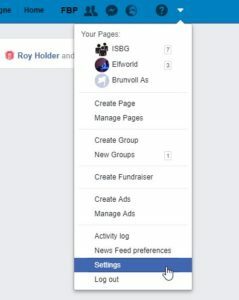 Is there anything about Facebook you would like a tip about? Leave a comment below!